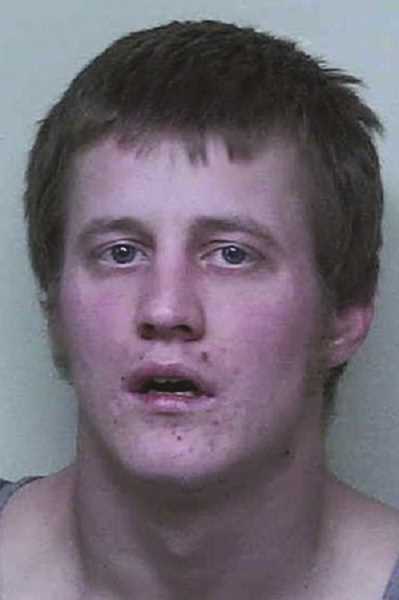 A Prineville man was arrested Tuesday after reportedly stealing a pick-up and trailer from a local parking lot and crashing it in a pasture. According to a Crook County Sheriff's Office report, at about 8 a.m., Prineville Police Department personnel were dispatched to Ochoco Feed Store following a report that one of the store's work vehicles had just been stolen. It was reported that a 1993 Ford F250 pulling a flatbed trailer had been stolen from the parking lot of the Ochoco Feed Store within the last few minutes while workers were loading the trailer with supplies for the work day. County and city law enforcement officials responded to the area, looking for the vehicle and learned that a suspect, 25-year-old Christopher McGee, had been hanging out in the area. At about 8:15 a.m., an Ochoco Feed Store employee, who had driven north of Prineville to look for the stolen Ford pickup and trailer, located it on Northwest Gerke Road. The employee, Dustin Brock, called dispatch to update responding law enforcement units. Brock followed the vehicle to the area of Northwest Charles Road, where he saw the pickup drive into a pasture and get stuck in a fence. Two county deputies later located the vehicle and took McGee into custody at gunpoint. Authorities determined that McGee stole the Ford pickup from the Ochoco Feed Store parking lot and drove north of Prineville erratically. He hit several mailboxes and damaged several fences and irrigation pipe as he drove randomly through several fields off Gerke Road. McGee was lodged in Crook County Jail with a bail set at $102,500. He was charged with two counts of unauthorized use of a motor vehicle, two counts of first-degree criminal mischief, four counts of second-degree criminal trespass, driving under the influence of intoxicants, first-degree theft, reckless driving and hit and run property damage.